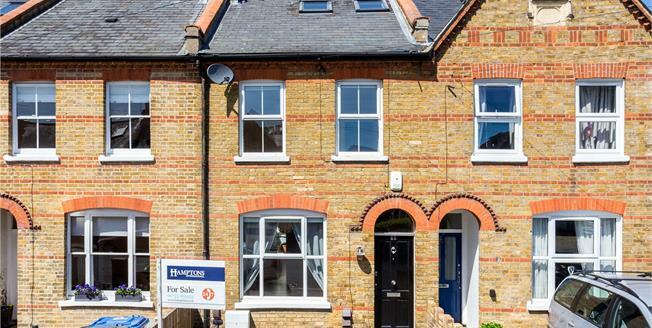 A 4 bedroom, 2 bathroom Victorian villa with a superb loft conversion, driveway parking and garden in the 'Boltons' area of Windsor town centre. The property has been extended to provide family accommodation over three floors with features including cornicing, wooden flooring and period fireplaces throughout. With underfloor heating on the ground floor, the open plan sitting/dining room is complimented with two feature fireplaces, engineered oak flooring and leads to the kitchen/diner. With it's own separate utility room (providing additional storage, belfast sink and a washing machine and dryer), the kitchen/diner is well appointed with a range of wooden units, granite work surfaces, integrated appliances, limestone flooring and roof lights creating a light open space. Door opens directly onto a rear facing conservatory overlooking the garden. Of note, a ground floor cloakroom completes the arrangement. The first floor comprises a spacious master bedroom with dual front aspect windows and feature fireplace together with a further two bedrooms and family bathroom. Staircase leads to a second floor bedroom at a generous 19 feet, with built in wardrobes, eaves storage, ensuite bathroom (with a double width walk in shower), and juliet balcony. Approached via a block paved driveway providing off street parking for one car. A walled rear garden is landscaped mainly to lawn, and features a raised decked terrace ideal for summer dining.